Hurricane Katrina City Skyline. A view of the Superdome and thousands of displaced people waiting outside for relief and support. Also features surrounding structures. New Orleans Mercedes Benz Superdome -no property release! Hurricane Katrina Superdome. Overhead perspective of the Superdome stadium in New Orleans, Louisiana in the aftermath of Hurricane Katrina. Hundreds of displaced people helplessly await assistance. Also gives a view of the surrounding flooded areas. Superdome New Orleans City. The exterior damage to the Superdome from Hurricane Katrina. People gather in the parking lot with remaining belongings. Superdome Relief New Orleans. Thousands of displaced survivors of Hurricane Katrina await relief and help outside of the Supedome arena in New Orleans, Louisiana. Also features a view of the skyline. Aerial shot of the New Orleans Superdome and cars traveling on the roads at night, moving upwards. Wide aerial shot of the New Orleans Superdome and cars traveling along the network of roads at night. Aerial shot of the New Orleans Superdome and cars traveling on the roads at night. 360 rotation of New Orleans by the Superdome. 1952? Passengers board the Olympian Hiawatha train at Union Station, and look at scenery and take picture through the second level Superdome. 1952� Passengers aboard the Olympian Hiawatha look at various scenery and the Missouri River through the second level Superdome. 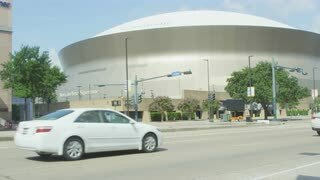 New Orleans Mercedes Benz Superdome - no property release! Shoreline Hurricane Katrina. Debris floating in the water of the shoreline with several structures in the distance, including the Superdome. Relief Effort New Orleans. Overhead perspective of thousands of displaced people awaiting evacuation and relief outside of the Superdome in New Orleans, Louisiana after Hurricane Katrina. Features surrounding damaged structures and flooded streets. Superdome Relief New Orleans. Thousands of displaced survivors of Hurricane Katrina await relief and help outside of the Supedome arena in New Orleans, Louisiana. Smoke Skyline New Orleans. Smoky skyline of New Orleans, Louisiana shortly after Hurricane Katrina. Includes a harbor, a view of a building on fire in the distance and a glimpse of the Superdome. New Orleans Hurricane Downtown. Damaged downtown buildings in New Orleans. The exterior damage to the Superdome. 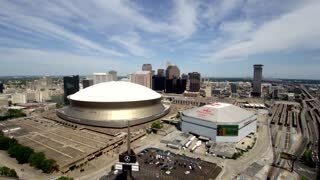 High angle aerial shot reveals the New orleans Louisiana skyline with Superdome in foreground. 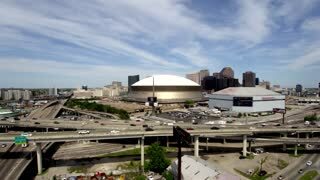 Rising aerial shot reveals the New orleans Louisiana skyline with Superdome in foreground.